At one point, email remarketing campaigns were known by a much more aggressive name: Email Blasts. As one might expect, such campaigns suffered from poor public perception. Think about it; would you want to have your email address “blasted” by a company you entrusted with your personal information? Such tactics are not only generally ineffective, they often lead to high unsubscription rates. Effective email remarketing aims to reach and re-engage customers with convincing, well constructed messaging, with the end goal of conversion. Companies use a wide variety of copy styles and graphics to create emails that customers will want to read. However, even if a company has beautifully designed visuals and outstanding copy, the success of the email still depends on the respondent opening the message. If she fails to do so, then the company’s efforts in contacting her were for naught. This is why methodical, well planned frequency is so important. Fortunately there is a great deal of research on this subject, which when leveraged, can dramatically improve open rates. One of the challenging aspects of determining an ideal frequency level for your emails is that there is no cookie cutter solution. According to the Direct Marketing Association, 35% of businesses send only one or two marketing emails per month; 19% sent just one per month, and 9% send more than six per month. With so much variance, it can seem difficult to determine your ideal send rate. As a general rule however, smaller companies should send fewer emails than larger companies. Obviously, the goal of email remarketing is to engage customers, and sending emails on a regular basis is a great way to do it. However, data shows that consumers, even those who signed up to receive marketing emails, strongly dislike being emailed too frequently. A study by DataChimp, compiled from over 9.5 billion data points, found that 69% of unsubscribe requests are the result of receiving “too many” emails. That being said, one of the most important things to consider in your email remarketing campaigns is why you are emailing your customers. Are you sending newsletters? Abandonment reminders/incentives? Advertising a sale? Promoting new inventory? All of these are legitimate reasons to send a remarketing email, however, frequency needs to be carefully considered. One way to understand email remarketing frequency is to think in terms of economics. Assuming that someone has signed up for a company’s emails, this constitutes a demand. It’s a company’s job to supply a certain amount of them. The sending of remarketing emails is a classic example of a risk/reward ratio. For each message a company sends, the odds of engaging a customer go up. However, at a certain point, the frequency will reach a state of diminishing returns, as unsubscribe requests increase, thus lowering conversions. Equilibrium is the point at which a company sends exactly enough emails to maximize new conversions while minimizing the number of unsubscribe requests. Although the exact frequency will vary by company, there are some “rules of thumb” to help guide this sort of decision making. None of these are written in stone, and can be adjusted until a company finds what works for them. In general, a company should send no more than one newsletter per month. The people on your email list obviously want to keep up to date, but like a relative who recently discovered Facebook, oversharing can quickly become a nuisance. Similarly, new inventory announcements, unless targeted at specific customers who are likely to have a strong interest in the merchandise, are best kept to once or twice a month except in the case of extremely important announcements. Informing users of a sale is a great way to land customers you may have missed the first time around, but the sale must be big enough to make it worth contacting your consumers. For instance, announcing that a small category of merchandise is now 5% off is unlikely to sway someone who did not purchase at full price, because the incentive is not large enough to warrant such a notice. However for sales with a greater scope and incentive, it absolutely makes sense to send several emails. A frequently used model is: One message promoting the initial sale, one reminding users of the sale, and one towards the end of the sale. Abandonment reminders are another great way to recover conversions. In general, these chains consist of between one and four messages, with three being about average. The odds of the successfully converting a recipient may be increased if the emails offer an incentive for purchase, such as a discount or free shipping. Regardless of whether or not an incentive is used, expanding beyond four is likely to come across as pestering, and may drive a user to unsubscribe. 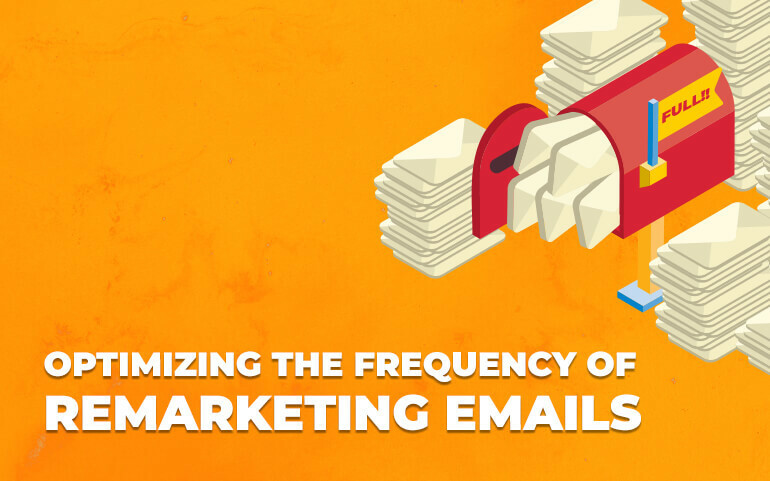 Determining effective frequency is a vital part of any company’s email remarketing strategy. While finding the right balance requires some tweaking, the guidelines in this article are an excellent place to start. When your email strategy works, the rewards can be huge: higher engagements, greater conversion rates, and higher order values.